Some see ‘biodiversity’ as a complex term. But if you break it down, it is quite simple. ‘Bio’ means ‘Life’. So biodiversity means ‘diversity of life’. The millions of different plants, animals and other species such as viruses and fungi. Each with an intrinsic value, independent of how we value them. After eons of evolution, these species have formed complex, interdependent ecosystems. For those interested to learn more about the state of biodiversity, see WWF”s Living Planet Report. Natural capital means the value of goods & services that nature provides. From fish stocks to carbon capturing timber; from protective mangroves to forested watersheds, from beautiful coral reefs to productive soils. If we don’t build this value into our economic system, exploitation of nature leads to system collapse. Because nature is resilient, but there are limits. Use of natural capital is only sustainable if nature is not over-exploited, but has a chance to recover. Simple really: don’t take out more than the system can regenerate, before you take some more. Our global economy does not yet work this way. We are robbing our own ‘natural’ bank accounts. Pulling the rug from under ourselves. How can we take nature into account? This needs Long-term Government Policies. Companies can look into their own impacts and dependencies on natural capital by applying the Natural Capital Protocol. 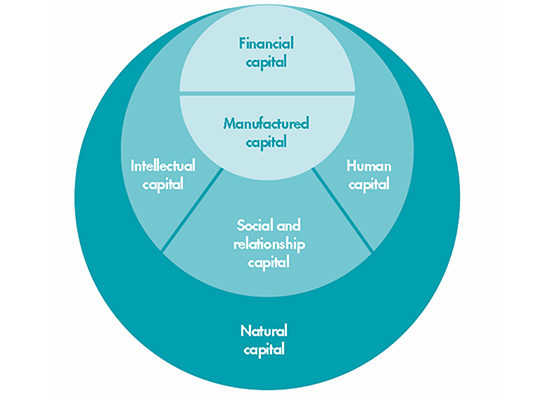 What is natural capital and what does it mean for businesses? The brief video above paints a clear picture! Below is an image that puts natural capital into perspective as one of six capitals. To read more about how each is defined, download the report by IIRC here.